Love, love, love this rug. Purchased for a little boy's playroom. The colors are very bright and stylish. Carolina Weavers Playroom Collection Dotted Border Teal Area Rug - 5'2" x 7'6"
Carolina Weavers Playroom Collection Dotted Border Teal Area Rug - 3'10" x 5'2"
Brighten up your home with this Playroom Collection dotted border area rug by Carolina Weavers. 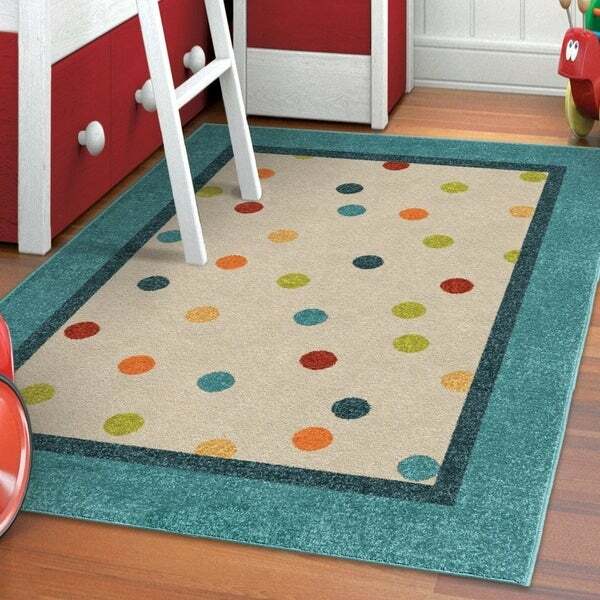 Expertly made with polypropylene, this rug is stain resistant for durable use in your child's room. Dimensions 63.0 In. X 7.0 In. X 7.0 In. for the price this is a very nice rug.The colors are beautiful and strong. It does not get dirty easily. Also, easy to clean and to keep it clean. I used it in my kids bedroom and I am very happy with it. I would definitely recommend this product. The colors are true and vibrant. Super cute rug just wish the material was softer/had more cushion. The floor is still very hard unless you use a thicker rug pad underneath then it is much better. I would still purchase this item again. this rug is super cute and perfect for a kids bedroom or playroom. The white can get dirty, but with some good carpet cleaner it cleans easily. Beautiful rug for playroom. My grandchildren love walking around the edge and jumping on different color circles. Soft. Gets a lot of usage and still looks great. We got this for our granddaughter's playroom...something playful that she won't outgrow in a year. The colors are rich, exactly as shown. Quality is terrific. Buy with confidence! Just put this rug down about a week ago and so far, so good. The quality seems good and it is pretty soft, but not super plush. The only thing is the colors are not as vivid as they look in the picture. Overall, I'm happy with it and the purchase was worth the price. Rug is perfect for the kids play room. It does not shed. Great but can get stained for a kids room on beige portion. I purchased this piece for my daughters play room. Its absolutely adorable in person and fits her space nicely. She has spilled food and drinks and clean up has been a breeze. It hasn't stained yet and is wearing great! LR Home Whimsical Flying Arrow Cream/Orange Kid Area Rug (3'6" x 5'6") - 3'6" x 5'6"